I’m a big fan of your television work; not many actors manage to cross over between television and film as gracefully as you have. There’s a new biography of Jack Kelly coming out next month. You and he seemed to have great chemistry in Maverick – what’s your best memory of working together? Yes I heard about the book on Jack. I think I may even have contributed to it. Jack was a great mate, and great fun. I remember most fondly our card schools at weekends and on evenings. I was a terrible gambler back then. It’s a pity we never got to work together again. Thanks for being kind enough to answer my previous question about my favorite show The Persuaders. Two of my favorite actors are you and Christopher Lee, so as you might imagine I especially enjoyed The Man With The Golden Gun. Britt Ekland is lovely and you and Mr. Lee are both so much fun to watch. I was wondering if you had any thoughts you would share about working with him and if you are friends off screen? If so, do you still see each other these days? I speak with Christopher occasionally, and about 18 months ago had lunch with him at The Ivy in London. I guess we probably go back further together than any other of our respective co-stars, back to 1946 when we were playing stage door johnnies in ‘Trottie True’. Who knows, if a film project Richard Kiel is pulling together comes off, we may well be on screen together again! I recently had a chance encounter with Michael G. Wilson at the train station in Wakefield, West Yorkshire, whilst commuting back home. That was quite a bit of luck for a Bond fan like me! He was very nice and civil, despite being accosted by a total stanger from France! What is he really like to work with? As one of the last independant film maker/producer in the cinema industry, he has a very high profile and always seem to be very professional. What memories do you have of him whilst working with Eon Productions? By the way, thanks for answering my question about Andrew Mc Laglen a couple of years ago. I look forward to read your new book. Michael was around the sets for as long as a can remember, first as a family member, then as legal advisor and then later as a producer and writer. He really did serve an apprenticeship in all departments! I always remember Michael as having a camera with him. He was and is an accomplished photographer, and quite an expert on all things relating to photography. I know he is involved with the film museum up in Bradford, and is often up there. Next time you see him, remind him that this old actor would still like to play a Bond villain! just briefly I want to tell you I have made my daughter Julia, 14 years old now, a fan of The Saint and The Persuaders and she´s also quite well familiar with the Bond movies. This is nice since since I have been a fan of yours since the early seventies. My question is; of all the movies you played in, excluding the Bond movies and the TV series, which 2-3 are your favourite movies (titles)? Thanking you for a really great book and a lot of enjoyment, I wish you a nice autumn and all the best. Your daughter obviously has very good taste. The Man Who Haunted himself is a favourite of mine, and the title sums up the story perfectly. Shout At The Devil is another provocative title, and a terrific story. As for my third? Hmmmm. I rather think Bullseye is a fun title. Not many people would agree the film matched it though. Ha! 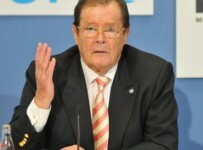 Dear Sir Roger, first all: Happy birthday!! Now the question of your month. You have a great voice and many times we heard you in documentaries and animation movies. I believe in the radio importance, even today in this era dominated for the image (cinema, video, internet, TV, etc), but some years ago the radio was the way for the imagination, in Colombia, my country, characterized for have in one territory many different sites and great diversity (Caribbean islands and ports, coast Pacific, Andean mountains, Amazon jungles, extensive plains, big cities and small towns) the radio ever were the link between the countrymen. Do you worked professionally in the radio? Did you considered this work option in the past? Thanks a lot. (Feliz Cumpleaños!! – again), best regards. I did a tiny little radio theatrical work, but nothing to boast about, in the early days. Of course I have done so many radio programmes since, as a guest, talking about myself or plugging a film (or book) I’m involved with. I rather enjoy radio, as you don’t have to dress up, can pick your nose and stuff a bun in your mouth when they play a record. (I am of course joking, but some newspapers take me seriously). Radio is very informal, friendly and fun – and you can often phone it in! Many thanks for answering my previous question. 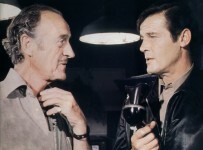 Really was a thrill to meet you in person at the Persuaders event. Linda was filming The Avengers at Elstree at the same time I was there with The Saint. We often used to socialise in the studio restaurant, or just wonder on to each other’s sets to say hello. I enjoyed The Avengers, and though Pat MacNee was superb in it. Is that out on blu-ray yet?